Hong Kong: Singapore Exchange Ltd. has announced a new product that an excited hedge-fund manager described to me as the “most brilliant use of finance." That’s an exaggeration, of course, though with a large grain of truth. SGX will launch three derivative products in June: SGX India futures; SGX India options; and SGX India bank futures. For 29 out of 30 days, these contracts won’t be anchored by any underlying security or index; they will be whatever their buyers and sellers want them to be. 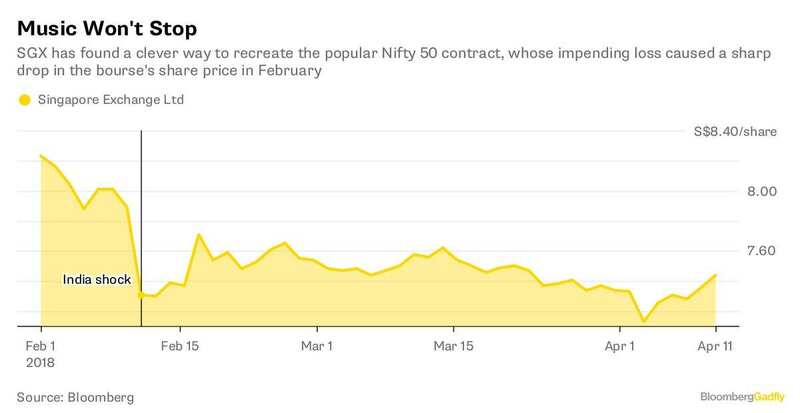 However, on the last Thursday of the month, they will get settled according to the average of publicly available expiry prices of futures and options on Nifty 50 (and Bank Nifty) benchmarks on the National Stock Exchange in Mumbai and its offshoot in Gift City in the province of Gujarat. The innovation is subtle, but remarkable. SGX is, in fact, turning the Nifty into a giraffe, which, as economist Hans Singer once famously quipped, is “difficult to describe, but you know one when you see one." Throw some Finance 101 into this lesson on bio-linguistics: If something is unmistakably equivalent to the Nifty index every last Thursday of the month, then it won’t become cowrie shells or gold bars on other days without creating a free lunch for arbitrageurs. Why go through all this rigmarole? The backstory is interesting. In February, three Indian equity exchanges came together and banned the use of local securities prices in offshore derivatives. The objective was to kill the newly launched single-stock Indian futures on SGX. The local bourses feared that these offshore derivatives would, like the popular SGX Nifty contract, take trading volumes away from them. Open interest on the gauge is twice as high in Singapore as at home. Vikram Limaye, CEO of NSE, put SGX on a rude, six-month notice: The license under which NSE provided data for the index future to its long-term partner would be scrapped by August, the Indian exchange said. As I wrote then, the approach was bound to irk index providers like MSCI Inc. that would view the ban as a restriction on access to Indian equities for global investors. That India had indeed scored an own-goal became evident when MSCI slammed the curbs as “unprecedented" for any venue in its emerging markets index, and said the country’s classification was at risk unless the measures were removed. SGX is now showing the Indian side a way to untwist its knickers. At some stage, the Singapore bourse will partner NSE to jointly offer trading and clearing for global investors in Gift City, panned by skeptics as a vanity project of Prime Minister Narendra Modi. Since that can’t happen before August (and need never happen if Modi doesn’t win next year’s general election), SGX’s new products will provide continuity to global investors without violating NSE’s data ban. 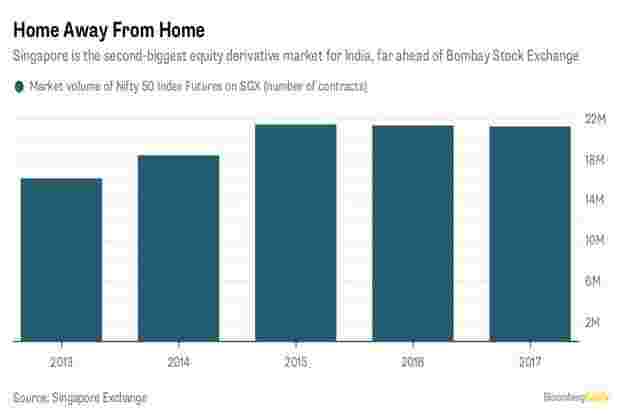 A hedge fund in the US can go long or short on the SGX India futures contract; the bank at the other end of the trade will use its access to the onshore Indian market to buy or sell the Nifty to manage its risk. Neither party will have any doubt that what they’re actually trading is the SGX Nifty, except it won’t be called that.